​We do not regularly train as a group. We have trained for specific events that our club membership have participated in. Many of the KW German Shepherd Club members are involved in sporting venues such as competition obedience, scent detection, herding, agility, lure coursing, Schutzhund/IPO/IGP, tracking and so much more. Before the dock diving event we had a lesson session with the trainer at K9 fun zone. Once again we were all very impressed with their skill at reading the dog and know how to help each one succeed. They also took some time to show us more advanced techniques with their competition dogs. ​​KW German Shepherd Club worked as a group in preparation for a temperament test held on Nov 13, 2016 at London Schutzhund club. All dogs from our club who entered the temperament test passed. Temperament Test focuses on different aspects of temperament such as stability, shyness, aggressiveness, and friendliness as well as the dog’s instinct for protectiveness towards its handler and/or self-preservation in the face of a threat. The dogs are compared to their breed standard and the types of training are also factors taken into consideration. Before the dock diving event we had a lesson session with the trainer at K9 fun zone. We were all very impressed with their skill at reading the dog and know how to help each one succeed. Each dog in the lessons jumped off the dock. KW German Shepherd Club participated in an 8 week Rally-Obedience course at Oxford Dog Sports! Rally is a companion sport to Obedience. Both events require teamwork between dog and handler, along with similar performance skills. Rally provides an excellent introduction to all companion performance events for dogs and handlers. The chief objective of rally is to provide a fast-moving and motivational activity that demonstrates the competency of handler and dog in performing basic obedience exercises without requiring exact precision for success. Rally can also provide the opportunity to refine training skills for competitors in other events. Dogs in rally obedience events should demonstrate willingness and enjoyment. To that end, handlers may use praise, encouragement, and petting throughout a rally course. "The Canine Good Neighbour Program is a 12-step test, that when completed successfully, will ensure that one of our most favoured companions, the dog, is accepted as a valued member of our communities right across the country. Canine Good Neighbours can be counted on to present good manners at home, in public places and in the presence of other dogs. The test is non-competitive and allows dog and handler to demonstrate confidence and control in 12 steps. It assesses the handler and dog's relationship, together with the handler's ability to control the dog. Dogs are evaluated on their ability to perform basic exercises as well as their ability to demonstrate good manners in everyday situations." Canadian Kennel Club, 2015. Congratulations to all those who completed their CKC Canine Good Neighbour; Zefra, Cayla, Ruger, Madison, Carly , and Frank! 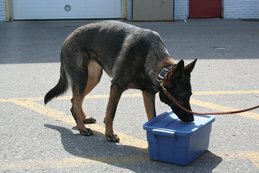 KW German Shepherd Club is proud to share that as a club, many of our members have teamed up and formed different teams for the Timed Team Tournament for the Canadian Sport Scent Detection Federation Team Challenge Trial on April 18 & 19, 2015. SG1 Cayla vom Amalaberg SD-S-SP, SD-A-SP, CSSDF-SD-B-CH, CSSDF-SD-A-CH Bronze Award of Merit "Cayla"
Grandview's Buck SD-S-SP, SD-A-SP, CSSDF-SD-A-CHx2 "Buck"
Carly SD-S, SD-A, CSSDF-SD-B-CH "Carly"
G Wild Winds Zephyr of Cognac HIC, NTD, ITD "Zefra"